The most recent X-men movie is the third of the First Class trilogy, and probably not last X-Men movie, which was preceded by “X-men: First class” and “X-Men: Days of future past”. I cannot say which one is my favorite of the three because the previous two aren’t very recent in my memory, but overall the third one had some very good moments, many thanks to the good acting and special effects that were pretty captivating. 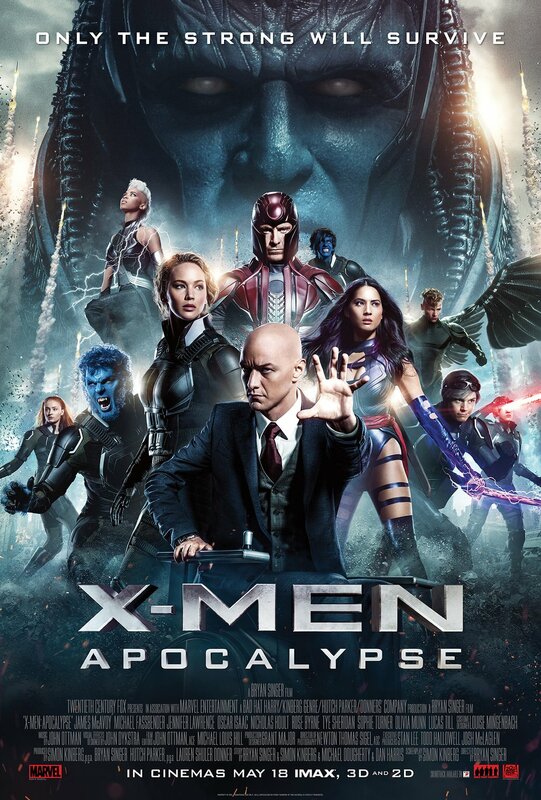 “X-men Apocalypse” kicks off with a flashback to ancient Egypt where we are presented with the first ever mutant, called Apocalypse, and how he went into some sort of hibernation until the humans of the 80’s accidentally woke him back to life after thousands of years of being trapped underground. Apocalypse is on a mission to gather troops again, “clean” the world and reinstate himself as leader of humans and mutants too. Back to Charles Xavier’s school, new recruits are being brought over in order to learn how to control their powers without causing any harm. Hank/Beast is still working close to Professor X while Raven/Mystique has the role of recruiter, saving a young mutant from 80’s East Berlin, where fights between mutants were held for entertainment purposes in shady locations. Magneto seems to be living a happy and fulfilling life with his wife and daughter in rural Poland, keeping a low profile and making efforts to be a part of the community. While old and new, anxious faces team up to fight against the big threat that Apocalypse poses to the world, Magneto faces his own personal drama that brings him to the edge yet again. Although Apocalypse does have a special ability that allows him to possess an insane amount of power and threatens and proceeds to ruin the world as we know it, by the time all the X-men get together and joining their forces, he doesn’t look so threatening anymore. But maybe that is how things are supposed to be, the X-men bring hope and salvation to the world even though at this point humans are still skeptical and maybe afraid of their role and abilities respectively. The thing is, reading that Apocalypse is one of the biggest enemies of the X-Men in the comics, if not THE biggest enemy, I expected a bit more in terms of his character. I really liked how well Jennifer Lawrence fits into her role here as a person to look up to for the young, reminding us a bit of her Mockingjay role from the Hunger Games. As a rebel character herself, it’s nice to see her turn into a mentor for the young mutants that study at Charles Xavier’s school. Michael Fassbender does a great job again as Magneto, but I was a little disappointed about how superficial his emotional journey is made to look in the end. I feel like the character deserved a bit more credit and deserved to not make it look like he changed minds so quickly over such dramatic circumstances. All in all, the movie is entertaining, administering a fair shot of adrenaline and suspense, captivating special effects and acting and a well-balanced dose of humor amongst all the tragedy and drama. Although the ending is pretty much predictable, you do get a few surprises along the way towards the movie’s conclusion. You also do get to see your favorite characters from the previous two movies, doing all the superhero movie fun stuff, with some young additions to the cast that reprise roles of characters you might already know from older X-men movies. Did you like X-men: Apocalypse? Are you a fan of the series?